Eau Claire is ready to join forces and become part of the largest national effort to recover America’s missing children. Fireball Run, an entertaining series which inspires travel, the production also raises awareness for missing children and Eau Claire has been selected to be the Green Flag City – or starting point – for the 11th season of this 26-episode adventure-travel competition series distributed by Amazon Instant Video. The Fireball Run is the story of 40 rally teams as they compete in a legendary 2,000-mile, life-sized trivia game. NOT a Reality TV series, Fireball Run is factual entertainment. Factual television is a genre of non-fiction depicting actual events and people. In addition to being an entertaining series that explores the under-discovered communities in America and an economic driver – the Fireball Run uses it popularity to fuel the largest national effort to recover America’s Missing Children. Working with the Children’s Rescue Network, the Fireball Run has aided in the recovery of 50 children in their 10 seasons. 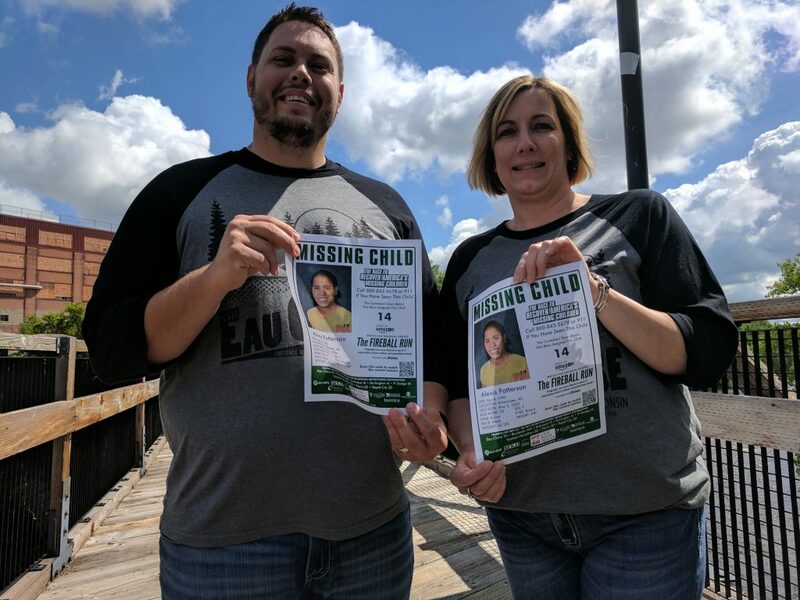 Eau Claire is not only the starting line for this adventure to bring the children home – but Luke Hanson, Executive Director of the EDC, and Julie Thoney, Community Service & Economic Development Manager of Xcel, will be participating and handing out missing children posters throughout the entire 2,000 mile journey. “I’m thrilled about taking the opportunity to share information on missing children during this journey and hope our efforts aid in bringing them home!” Julie Thoney from Xcel Energy and one half of Eau Claire’s team in Season 11, the Xcelerators. The Eau Claire Area EDC is working with community partners such as City of Eau Claire, Eau Claire County, Visit Eau Claire, Eau Claire Chamber of Commerce, ECRAC, City of Altoona, Xcel Energy, iHeartMedia, Wisconsin Public Radio, Action City, and The Lismore to bring this exciting opportunity to Eau Claire.